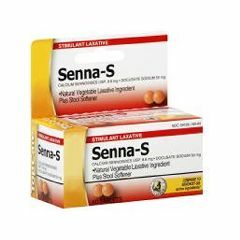 Senna-S Laxitive helps patients return to regularity with the formula that's right for their needs. This sugar-free, low-sodium formula contains 8.6 mg of sennosides and 50 mg of docusate sodium per tablet. Compares to Senokot S.